Studies were initiated to determine the acute toxicity of technical grade glyphosate (MON0573), the isopropylamine salt of glyphosate (MON0139), the formulated herbicide Roundup® (MON02139), and the Roundup® surfactant (MON0818) to four aquatic invertebrates and four fishes: daphnids (Daphnia magna), scuds (Gammarus pseudolimnaeus), midge larvae (Chironomous plumosus), mayfly nymphs (Ephemerella walkeri), Rainbow trout (Salmo gairdneri), fathead minnows (Pimephales promelas), channel catfish (Ictalurus punctatus), and bluegills (Lepomis macrochirus). Acute toxicities for Roundup ranged from 2.3 mg/L (96-h LC50, fathead minnow) to 43 mg/L (48-h EC50, mature scuds). Toxicities of the surfactant were similar to those of the Roundup formulation. 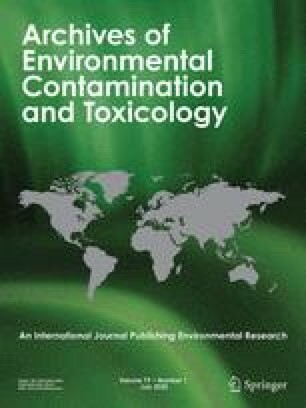 Technical glyphosate was considerably less toxic than Roundup or the surfactant; for midge larvae, the 48-h EC50 was 55 mg/L and for rainbow trout, the 96-h LC50 was 140 mg/L. Roundup was more toxic to rainbow trout and bluegills at the higher test temperatures, and at pH 7.5 than at pH 6.5. Toxicity did not increase at pH 8.5 or 9.5. Eyed eggs were the least sensitive life stage, but toxicity increased markedly as the fish entered the sac fry and early swim-up stages. No changes in fecundity or gonadosomatic index were observed in adult rainbow trout treated with the isopropylamine salt or Roundup up to 2.0 mg/L. The aging of Roundup test solutions for seven days did not reduce toxicity to midge larvae, rainbow trout or bluegills. In avoidance studies, rainbow trout did not avoid concentrations of the isopropylamine salt up to 10.0 mg/L; mayfly nymphs avoided 10.0 mg/L of Roundup, but not 1.0 mg/L. In a simulated field application, midge larvae avoided 2.0 mg/L of Roundup. Application of Roundup, at recommended rates, along ditchbank areas of irrigation canals should not adversely affect resident populations of fish or invertebrates. However, spring applications in lentic situations, where dissolved oxygen levels are low or temperatures are elevated, could be hazardous to young-of-the-year-fishes.